Then, there was more cutting. For bags this time. My goal is to have a spring shop update with this collection around mid March. Sound good to you? How do you like my new lounge pants? They arrived in the mail today and I put them on as soon as I opened the package. They look snazzy with my fuscia argyle cardigan, don't they? I've been wanting a pair of these for ages, but never got around to making myself a pair. When my friend Chris (Miss Pink Picket Fence) opened an etsy shop last week and I saw these, I had to have them. 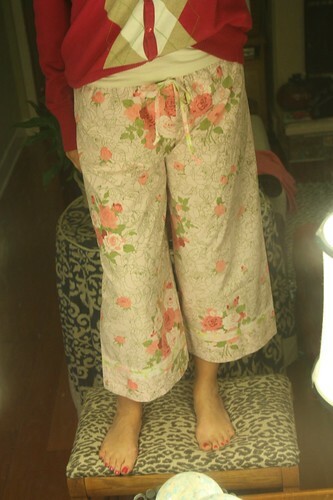 These super soft pants are made from vintage linens (my favorite). Chris, they're excellent! Your workmanship is spot on. Love, love, love them!! My new favorite pants weren't the only thing to show up in my mailbox - isn't this little bag sweet? 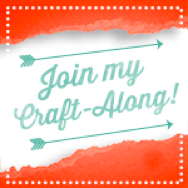 I purchased it from the Craft Hope shop. I happened to be the one listing this item, so it took some fast clicking to get it (you know, I had to log off as craft hope, then log in as myself to purchase). At the time, things were selling as soon as they listed, so I consider myself lucky. I ordered it thinking that I'd give it to Ava, but now I'm not so sure. Maybe when she's older. That embroidery is simply stunning. I think this little bag is too pretty to use! 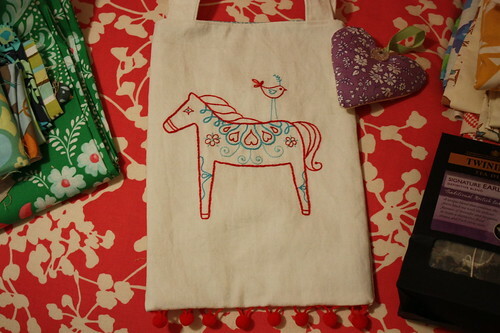 Joanie, the bag maker sent along some extras, which was super thoughtful. I love getting the extras! 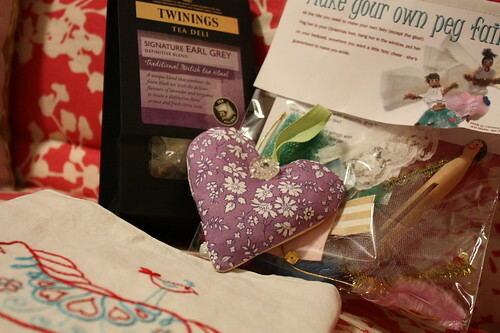 She included a peg fairy kit, a lavender sachet, and some tea. Thank you, Joanie, I love it all! Oh, Chris also sent along some, uh, extras. How about that? I can honestly say that I've never seen anything like it. 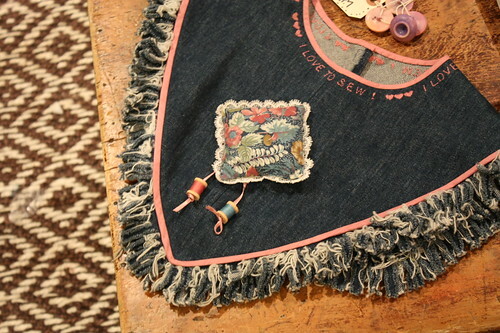 I suppose every seamstress needs a denim bib with an attached pin cushion (+ spools of thread) and "I LOVE TO SEW !" 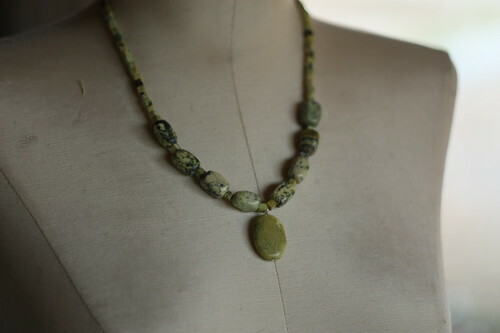 + hearts embroidered around the neck. Chris, really, you shouldn't have! I'm sure you had a tough time parting with that one :-) All I can say is 'wow'. 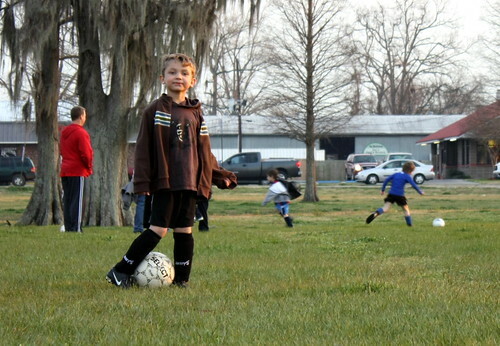 I asked Ava is she would like to model it for me, but she declined. If you're in the mood for some shopping, the Craft Hope shop is still stocked with some great items, the proceeds of which will go to Doctors without Borders to help with Haiti. Chris even has some vintage linen items there, which will appear in the Craft Hope book due out later this year. And while you're over at etsy, stop by the Pink Picket Fence shop, too!! Goodness gracious - I wasn't expecting ALL THAT!!! Y'all are the best, really. Thanks for all your comments on my last post, I read each and every one of them. 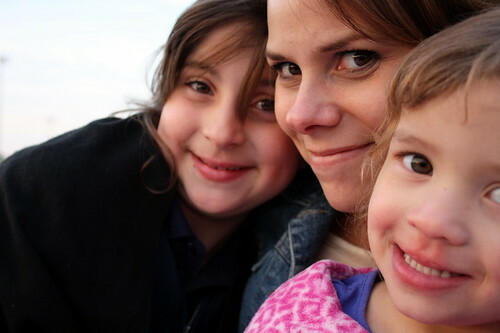 They kept me smiling all weekend long. There's no need to worry, nothing will change around here, except maybe being a little more chatty. 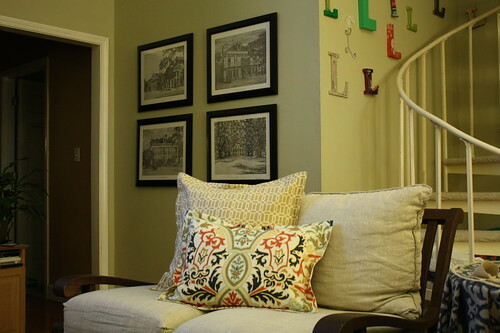 Occupying most of my brain space these days is sprucing up my home. I blame spring fever. The last time I went through this was late last summer when I re-vamped my living room. I never did show you the results because I never quite finished it. Well, now I'm already changing it - not too much, just a little bit of rearranging and some new throw pillows (and I'm still not finished!!). My poor throw pillows. After only 6 months, they were looking pretty rough. A chewed up ink pen (thanks, Ruby) didn't help the situation any, plus, I was getting kind of sick of the stripes. After a few trips to the fabric store, I had a plan. I'm not finished yet, but so far, so good. I was also tired the location of my big leaner mirror (which was on the wall in the first photo). I thought getting it was a brilliant idea, but shortly after bringing it home, I learned that it was a kid magnet. We had to anchor it to the wall so that they wouldn't knock it over. I had to constantly clean it because they wanted to touch it, kiss it, and generally be all over it. I feared that they will fall onto it, so I moved the mirror behind the console table behind my sofa. I like it in its' new spot - it looks kind of fancy that way. Moving the mirror meant that I had to move the architectural prints that were hanging above the table. I simply swapped their places. There wasn't enough room for all 6 prints, but 4 works just fine. 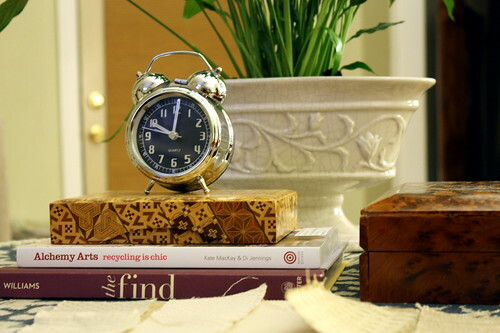 On my round table top, I replanted my planter (which had a pitiful dying plant in it) and I found a cute silver clock (those are fabric swatches in the foreground, I still need one more pillow fabric). 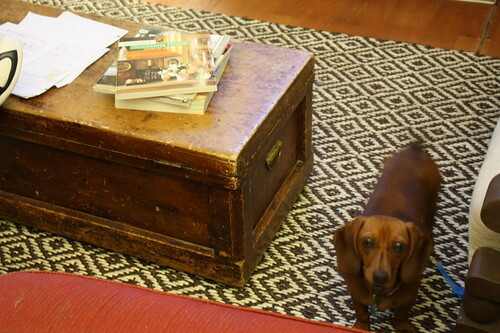 I swapped out my cube ottomans with my heirloom blanket chest, which was made by my grandmother's great-grandfather. Pretty cool, huh? It usually resides at the foot of my bed, but I was ready for a real table surface to hold books and whatnot. I love having old family pieces. 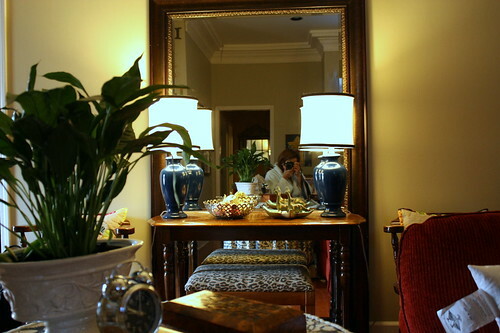 That console table in front of the mirror is also a family piece, it belonged to my grandmother's grandmother. 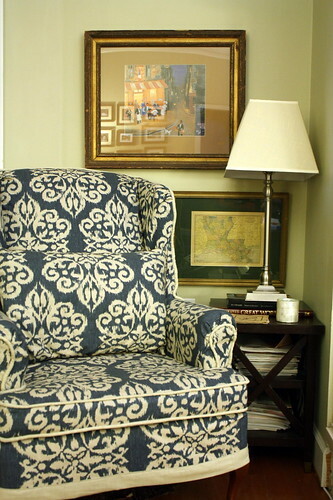 The last change I made was to move a little side table next to my slip-covered wing back chair. I previously had a plant there, but the plant was looking kind of sorry and needed to be on the patio for a while to rejuvenate. That map won't stay there, I was just testing it out. It's a little too big for that space. Matt told me that I have to keep things in their new places for at least 2 days before I change it again- he knows me well. I'm not sure that particular table will stay there, but I like having a lamp in that corner to make a cozy reading spot. 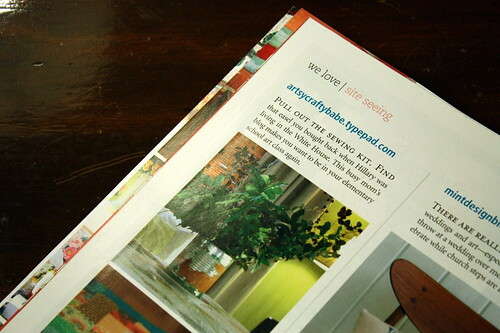 And while I'm on the topic of home decorating, if you happen to pick up the March issue of Romantic Homes magazine, you'll see a mention of my blog under the "sites we love" section. I'm not going to lie, seeing your name (or blog) in print never gets old! Dufus that I am, I forgot to tell them that all photographs were my own, so my name doesn't appear. That's okay, y'all know who I am! Good news, my poor fingers have healed enough to be functional again! I still manage to bang my knuckle about 10 times a day right where that cut is healing (which hurts like hell), but it doesn't bleed any more, so that's a good sign. Isn't it crazy how such seemingly little things cause so much pain? As soon as the craziness of the day settled down yesterday, I escaped to my sewing room. I started this bag before my injuries, which wasn't that long ago, but my goodness, I had a hard time remembering where I left off. Everything was already cut out, all I had to do was sew. 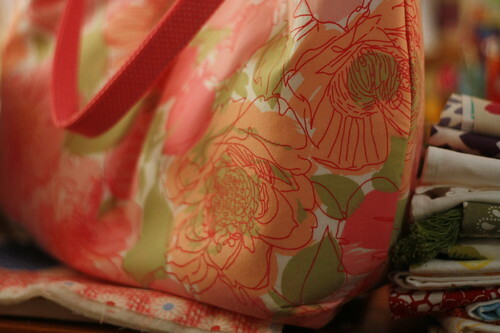 When I committed myself to a spring line using vintage linens, I knew that I wanted to include a tote sort of bag. 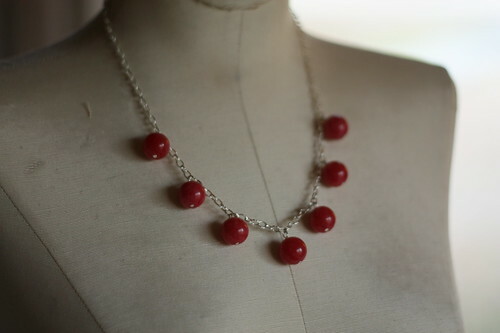 It had to be something fresh looking, something you'd want to use with a cute dress or jeans and springy cardigan. 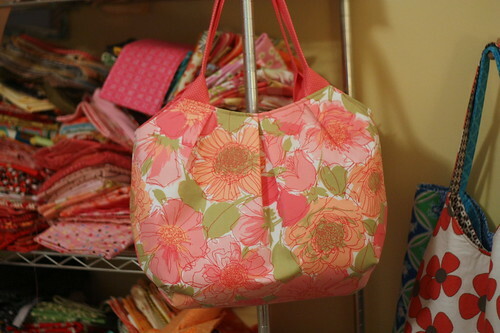 My first thought was one of those bias trimmed bagswith the bias trim handle, but I don't like to make those. Fiddling with bias trim is a pain, and making my own bias trim is even more of a pain, so that idea was out. 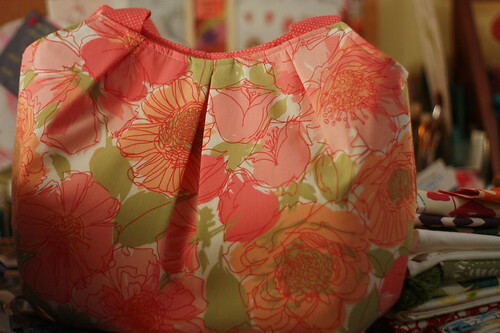 Plus, when I've made those sort of bags I feel like the handles aren't strong enough. After 2 failed attempts, I came up with what I think is a winner. My first version was too poofy, my second was too wide, but this one is just right. In fact, I'm a little in love with it. 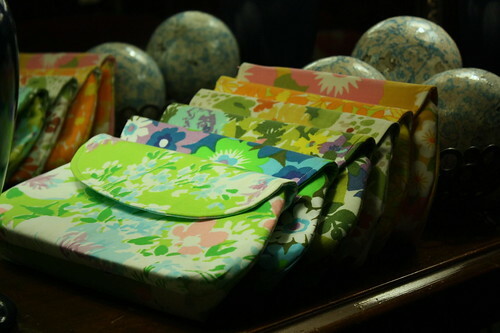 Along with the clutches, you can expect to find some of these in my spring shop update. 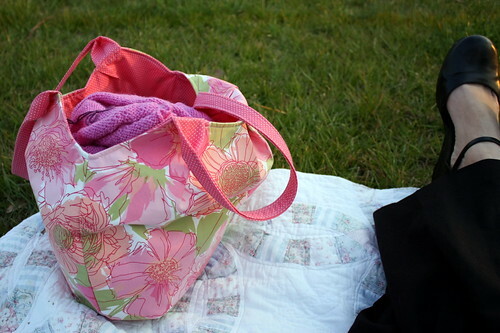 I plan to include 2 more designs as well - a smaller bag and small zippered pouch - everything will have an exterior made from vintage linens with a polka dot lining. I've never done a collection of bags with a common theme before. This whole process has been much more fun than I thought - so much fun that I might just have to do it again! Whoops, sorry about that. I didn't mean to disappear. There isn't any good reason for my absence other than being caught up in life. 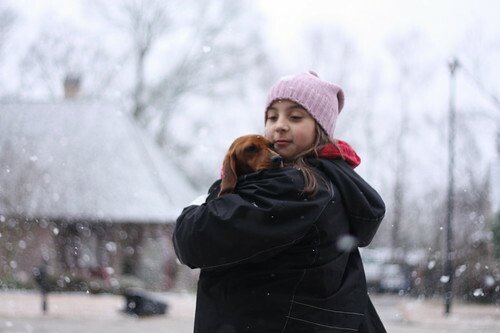 I suppose the biggest news around here was the rare snowfall we received on Friday. School was canceled, adding another day to the long holiday weekend (Mardi Gras is Tuesday, so Monday & Tuesday are holidays). That ended up being a day full of cooking, baking, and eating. Isn't that what you're supposed to do on a snow day? With my finger healing, I thought I'd get some sewing done. I attempted, but I ended up with another injury - I sewed through my finger!! Yes, the needle went through one side of my index finger and out the other, right on the side of my nail - OUCH!!! My poor hands have been having a tough time lately. The tenderness is gone now, so I think I'll be in business as soon as all my ordered supplies arrive. 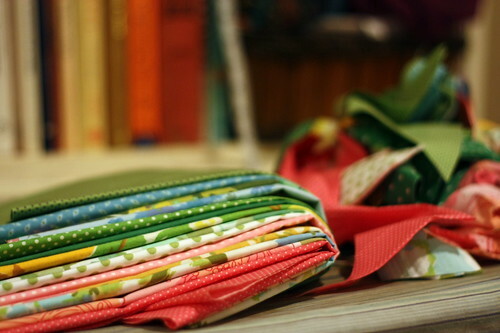 Yes, once I got started I realized that I was out of everything - interfacing, zippers, and magnetic snaps. At this point the only thing I'm waiting on is interfacing. All these delays are starting to concern me...I only hope that once I get everything needed I still feel like sewing. 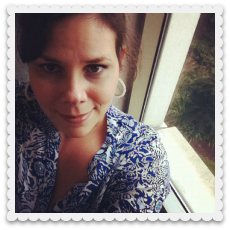 With sewing & knitting on the back burner due to injuries, I was beginning to feel twitchy. 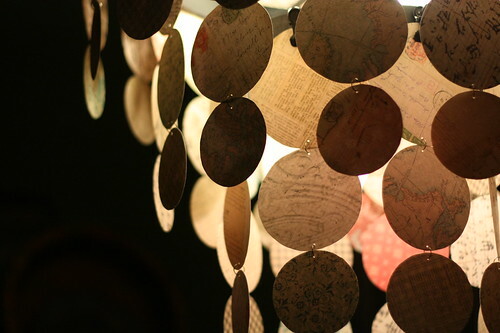 I can only redecorate my chandelier so many times, so I had to find something creative to do. I made some jewelry. I am no jewelry designer by any means, so don't laugh, but think these came out okay (well, that silver glass bead one is a kind of shiny). I have no doubt that I'll wear them. At this point, I feel like I'm still searching for my style. To me, all three of these necklaces are quite different, but that's all part of the learning process, right? 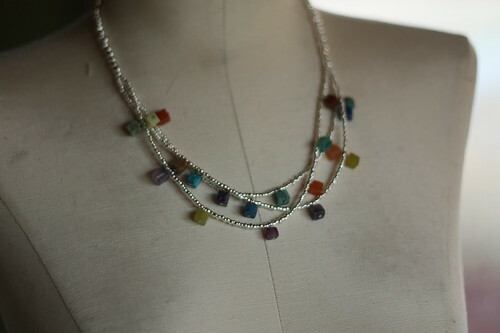 It was fun playing with my beads, though it only makes me want more. 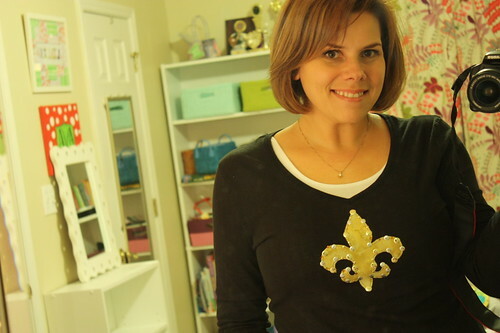 Have you ever shopped for beads? They're like CANDY...and I have a big time sweet tooth!!! Seriously, I need to practice some self restraint!! I need another hobby like I need a hole in the head. I think this may be a record for us...Matt and I are do-it-yourselfers, but the problem is that we don't really have time to do it ourselves. The usual situation is that we get the supplies and then...it sits. This is why my kitchen still doesn't have new counter tops over 2 years after starting that project. 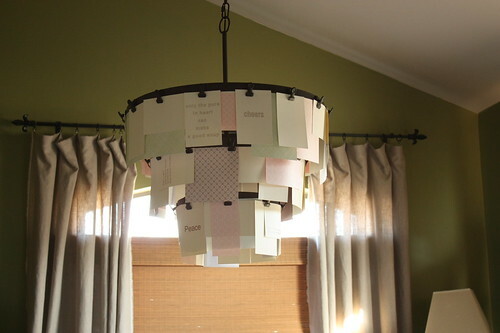 A few weeks ago we ordered this chandelier. I was instantly in love. 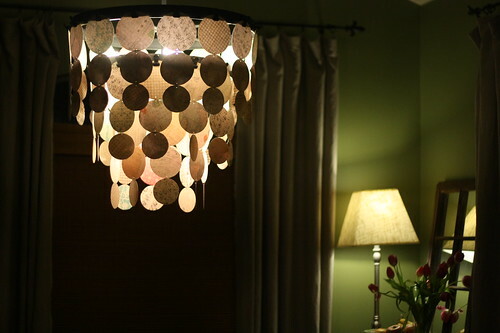 I've never shown you the light that was hanging in that room because it was, well, embarrassing. A big mass of glass & brass. Nice. Of course, after almost 5 years of living with it, I didn't notice it anymore, until I had guests over. In my mind we would install the new light immediately, but realistically I knew that wouldn't happen. I think the dinner guests did it. We only left it in the box for about a week or so! 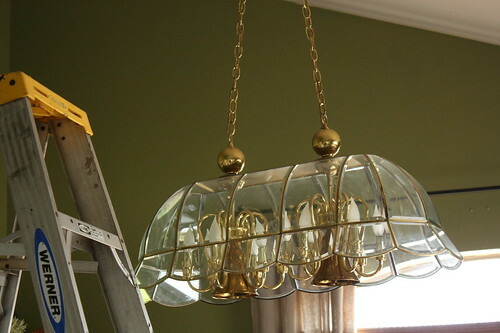 A few hours before our guests were to arrive we installed the new chandelier. Gosh, what an improvement! I wasn't really prepared, so I just hung the cards that came with it. It was okay, but I envisioned more. Actually, I envisioned something more like the book pages that were shown on the website, but you don't get that when you order it. 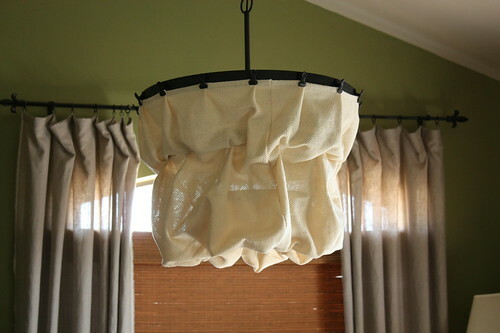 After looking at my skimpy chandelier all evening, I was ready for a change the next morning. 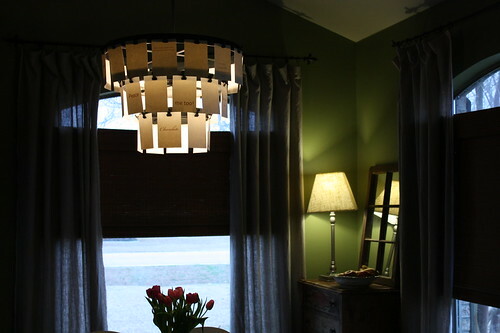 The cards came down and a tube of open weave fabric went up. Eh, still not what I had in mind. I really needed more fabric to make what was in my mind, and my bum finger wasn't helping the situation any, but it was fun to experiment and I could see the possibilities. In the end, the fabric came down and the cards went back up, but with some printed paper. Again, I was using what I had on hand. It still wasn't exactly what I wanted, but I need supplies for that. On Monday I made my way to Hobby Lobby to pick up some scrapbook paper, which happened to be on sale for 50% off. I really wanted mostly whites & off-whites, but they didn't have that, so I got the most neutral double sided papers I could find. While I was there I also picked up a tiny hole punch and some large jump rings - also 50% 0ff. With my new half priced supplies, I cut out circles in 3 sizes then attached them together with the jump rings. Each clip got a strand of circles. Voila, a whole new look! Next, I'd like to try some type of crochet/knitted wire, or something like that. I can see myself having LOTS of fun with this! I had big plans for this past weekend. I was going to be super productive on that "spring line". 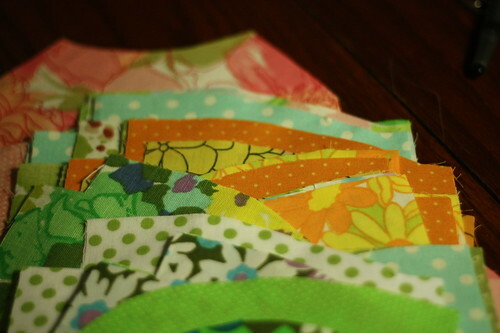 As of Friday night I was right on track - a number of clutches had been cut out along with the makings of a bag. Seeing all those florals and dots together is so sweet! Saturday was my day off. 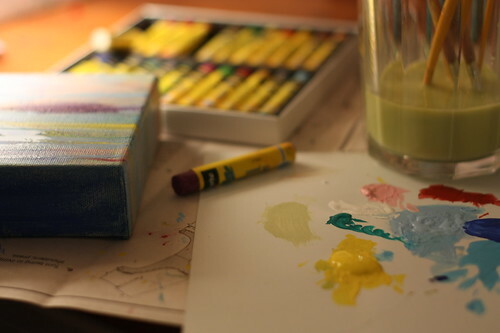 We were having guests for dinner that night, so I spent my time relaxing and preparing. Yes, I actually had someone over for dinner! I think I'm finally getting over my entertaining fears. 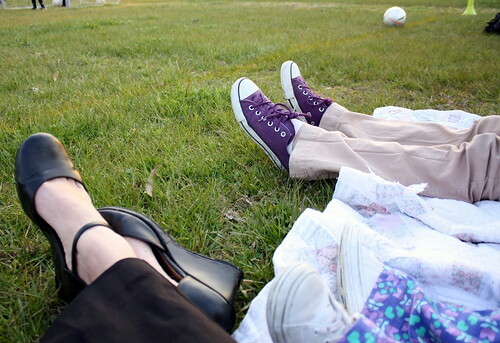 It was an all around delightful evening, something I look forward to doing again soon! 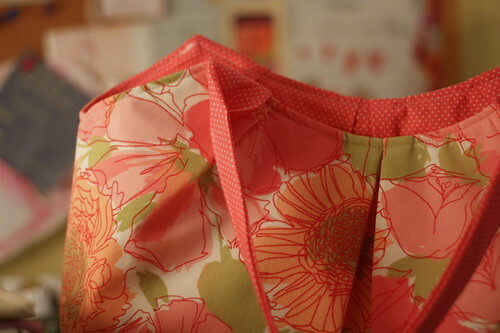 Sunday was going to be the day when I spent some time with my sewing machine. 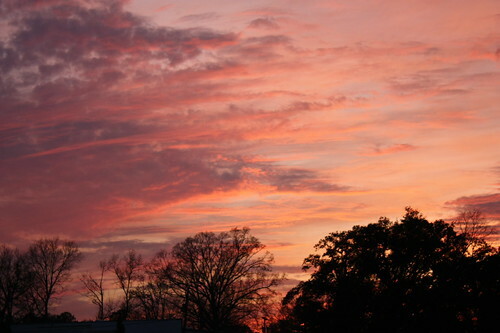 As I was washing dishes Sun. morning, my hand banged against a broken glass, which resulted in a big u-shaped cut across the top of middle finger, right on the middle joint. Ouch! At the time, I didn't realize how limited my actions would be with a bum finger, but I can't do anything!! No knitting, no sewing, no nothing. It looks like all crafting will be on hold for a few days until my finger heals. I guess it all worked out because I was too excited to sew on Sunday anyway. 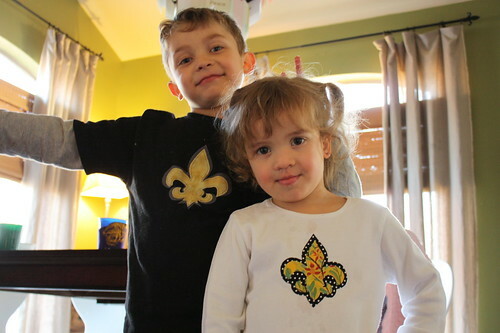 In fact, tonight will be an early night to bed after staying up too late celebrating the Super Bowl victory last night. A few days of rest will be a good thing!